Mangaluru, Sep 3,2016: Briefing media here on Sept 2, Friday, Team Mangalore Founder Sarvesh Rao ’Surya,’ ’Deepa,’ ’Bird’ and a variety of delta kites will be taken to the festival. The theme of this year’s festival is ’Arts Premiers’ - aboriginal, indigenous, native and traditional folk art. 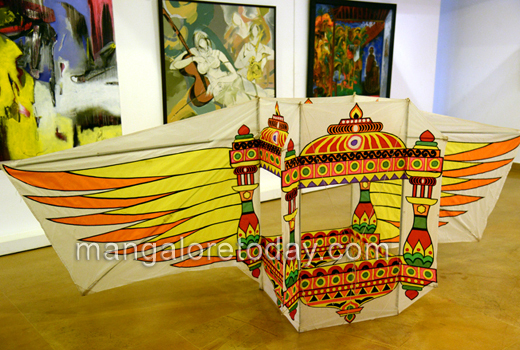 Team Mangalore’s ’Dampathi,’ a 12-foot long and 12-foot wide applique delta kite and ’Adivasi’, a 8-foot long and 5-foot wide Rokkaki kite will be attractions at the 19th International Kite Festival to be held at Dieppe Beach in France from September 10 to 18. He said ’Dhampathi’ kite has a couple wearing traditional costume of India with ’Kacche,’ ’Anklet,’ ’Mundasu’ and saree. The Adivasi kite highlights the traditional tribes. The two kites have been designed by Dinesh Holla with Pranesh, Sathish Rao and Sarvesh Rao. 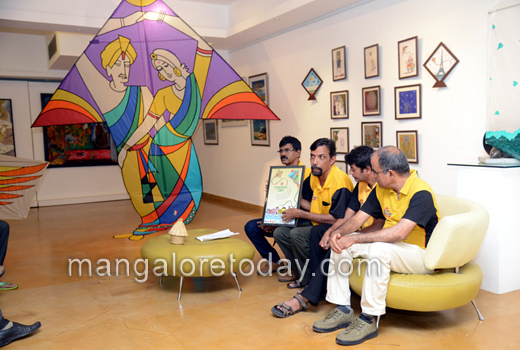 Team Mangaluru, a hobby group of kite flyers and makers, has been attending the kite festival at Dieppe since 2006. Holla and Sathish Rao of the team will be attending the show with team’s creativity kites this year. For the first time since its inception, Holla, the designer of Team Mangalore’s kites, was the brain behind the aesthetically designed publicity poster of 2014 and 2016 edition of the event with an invitation to the signing session on his designed publicity posters purchased as a souvenir by every visitor. On the poster, Holla said that it features Dieppe, the port city of France where fishing is one of the main activities with European style buildings on the shore. The poster has also given importance to nature through its colours. On the tail of all the kites in the poster, there is intrinsically designed Indian Rangoli, he explained. Live line art demo : Holla said he has been invited by the organisers - Dieppe Capital of Kites Sandrine Frebourg - to exhibit 36 framed line art works titled ’Raga Rekha’ at the main entrance hall of the event. The special attraction at the venue is a live demonstration of line art sketch on 36-metre canvas featuring the essence of tribal art form from 28 states from Kashmir to Kanyakumari and Gujarat to Nagaland. The tribal line art aims to bring the audience closer to a fascinating traditional folk art form that signifies India’s rich heritage and culture of tribals. The canvas will be made available for sale at the venue and part of the fund raised through the sale will be used for the education of tribal students of Western Ghats, he said. The inspiration for his line art on tribals has come from Soligas of Biligirirangana (BR) Hills, he said. The tribal line art will feature tribes of ’Bagata’ ’Chenchu,’ ’Pardhan’ of Andhra Pradesh, Abore, Singpho, Hajong tribes of Arunachal Pradesh, Chakma, Bodo of Assam, ’Bajnara,’ ’Baiga’ of Bihar, Agaria and Bhunjia of Chattisgarh, ’Dhodiya,’ ’Dubla’ of Goa, Barda and Chodhara of Gujarat, Gaddi, Gujjar of Himachal Pradesh, Changpa, Bakarwal of Jammu and Kashmir, ’Soliga,’ ’Thoda,’ ’Siddhi,’ ’Kudubi,’ of Karnataka, ’Adiyans’ and ’Kochuvelan’ of Kerala, ’Damaria’ of Madhya Pradesh, ’Rajagonda’ of Maharashtra, ’Agami’ of Manipura, Dimasa, Kachari of Meghalaya, Hongsang of Mizoram, Naga of Nagaland, Chaimal of Tripura, Buksa of Uttarkhand, Birhor and Mahali of West Bengal, Jarwas and Sentinels of Andaman, he explained. The Team Mangalore will be taking model of traditional ’Thuppe’ (for preserving paddy), boat houses of Kerala, Mantapa of Channarayapatna to offer it as memento for the Mayor of Dieppe and the organisers of kite festival.